Our easy cashew chicken recipe has quickly grown into one of the most popular recipes on our blog. This is the dish we always turn to when we are in the mood for some Thai takeout! If you’re looking for something to soak up your cashew chicken sauce with then give our fried rice a try. Update 2/23/2017: So many people loved this recipe that we decided to make a video for it! This easy cashew chicken recipe has many inspirations behind it, but the two main ones are you guys, our viewers who have requested more asian recipes, and Thai Spice, a restaurant in San Francisco Matt and I used to frequent. If anyone is looking for a good Thai Restaurant near Fisherman’s Wharf, be sure to hit up Thai Spice. The beauty in this recipe is how complex it seems from its flavor profiles, but how simple it actually is to make at home. No special wok or obscure ingredients are required! You have to try this easy cashew chicken today! When Matt is away I normally find myself spending all day and night in the kitchen throwing together random things in hopes of a winning recipe. However, the most recent time Matt went home I had a vision in mind. An Asian infused vision. We had a lot of requests for asian recipes from viewers so I knew just one recipe wouldn’t cut it. I wanted to take a weekend long detour and truly explore the flavors of asian cuisine and do my best to create delicious keto versions of some of the classics. This easy cashew chicken stir fry is just the first offering of many! 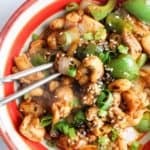 This Easy Cashew Chicken is the first recipe I decided to remake. While missing him and reminiscing on our life together in San Francisco, I was easily able to recreate the intense, complementary flavors in this dish. You can eat this on its own (what I did) or you can serve it over cauliflower fried rice! The sauce that coats the chicken, cashews and vegetables will seep into the rice just like happens with normal asian take-out. Isn’t that the best?! However, if cashew chicken isn’t one of your favorite take-out recipes or you’re just looking for something different check out this keto pad thai or this keto sushi! Increase heat to high and add coconut oil to pan. Add liquid aminos, rice wine vinegar, and cashews. Cook on high and allow the liquid to reduce down until it is a sticky consistency, There should not be excess liquid in the pan upon completing cooking.